You can follow what I'm up to on twitter and get the latest updates on the Photoshop brushes sets and new free Photoshop textures and keep up with other design bits and bobs. Here's a quick update on the last few weeks including a new Grunge Wordpress Theme that I created (will be available for free download soon) using my PS brushes and a selection of images featured on my site. 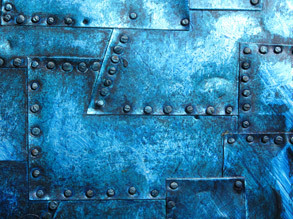 A selection of six hi res 2000 pixel wide grunge style metal plate textures, made from metal sheet nailed, painted and scratched, some interesting textures on these new ones. Just released a new simple Photoshop Tutorial the basics on how to use Photoshop Layer Masks. A beginners guide on how to apply a layer mask to an image, how they work and what you can mask out. 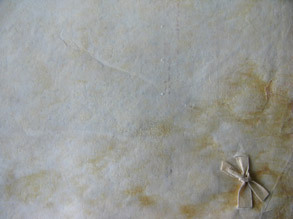 A cool selection of new parchment and aged paper texture wallpapers (2000 pixel wide) to the site, got loads and loads of textures that I have started adding on the new Textures site. 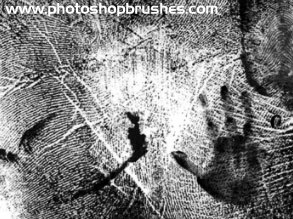 Fourteen new large Fingerprint Brushes set with two very big textured hand prints also available on this page are some other smaller hand prints, I have again re worked my twitter background (link above) using the new set so you guys can seen how they will look on a large scale. This new set of eighteen Stain Photoshop Brushes are again very large and have some excellent textures, recently used these on my twitter background (links above) gives you guys an idea of what they can look like. 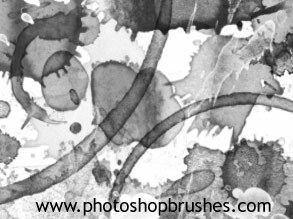 The new PS brushes are all created from coffee splats and splodges also added a few nice coffee cup ring marks as well. 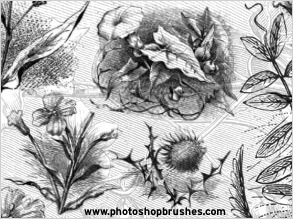 This latest set of Photoshop Brushes features fourteen large Floral Illustration Brushes , these feature a mix of plants and flowers in an illustration style. Will also be releasing a new set of Corner Illustration Brushes to go with these in the near future, click on the link for a quick preview of one of them. Will be adding loads of the new sets in the next few weeks, along with the new Adobe photoshop brushes I'll be adding more design tips and tricks on using them and new tutorials on using Photoshop. The Photoshop Brushes website now offers loads of free sets of PS Brushes for free download, more detailed information on the progress of the site can be found on the news page. The Photoshop website has a Photoshop News section to keep regular visitors to the site up to date with new photoshop downloads and Adobe photoshop tutorials. Its more like a diary of what I am doing and thinking about. The PS Brushes site also features loads of sets of my Photoshop Brushes created for free download, these are now being added to all the time, please take a quick look at the Credits Page before downloading. The new sets are now being put into groups as the brush sets gets larger, I have already created a Grunge Photoshop Brushes and Skull Brushes sections featuring loads of sets of grunge and skulls, more of these will be updated with new larger Photoshop brushes as the site grows.